We found some pretty cool stories – and photos – concerning Internet Hall of Famers who were in the news in November. In addition to providing insightful food for thought in interviews, they themselves turned up as subjects for the media far and wide. Here are a few examples. Here is one of the more delightful photos to appear on the Web recently. 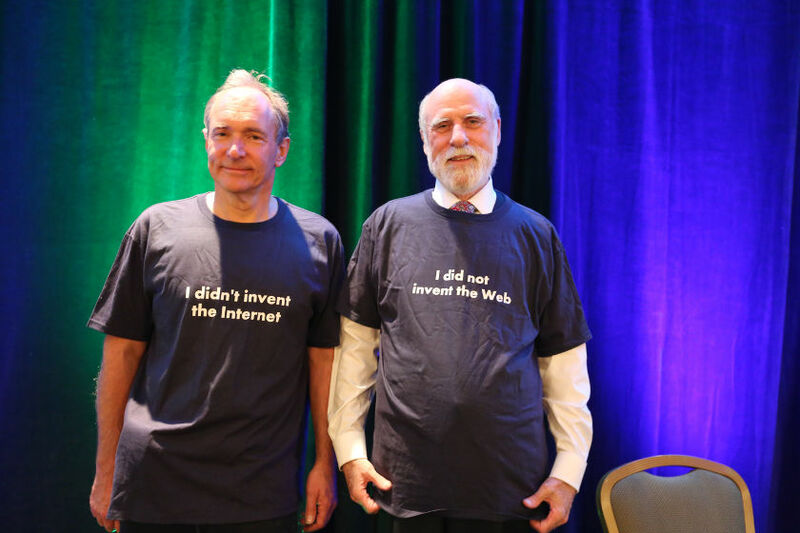 Did anyone ever say that Vint Cerf and Tim Berners-Lee didn’t have a sense of humor? The fact that Internet Hall of Famers Radia Perlman and Dorcas Muthoni aren’t household names is a failure of society, says a Columbia Spectator columnist. Brewster Kahle announces that his Internet Archive is taking a new direction. John Perry Barlow took to Twitter to urge everyone to watch the highly-regarded film about his fellow Internet Hall of Famer, the late Aaron Swartz.